This summer saw a rush of bike buying as all those pub cycle rides turned some runners into a bunch of budding duathloners. 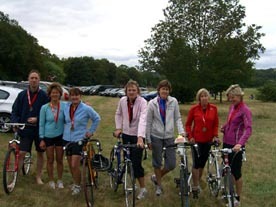 An impressive 9 club members made it to the start line of the London Duathlon in Richmond Park on 13th September, and all finished the race in good times with no spills. Some of the times for the final 5k run were pretty amazing, but the transition times were rather slow in some cases. (What were you doing Ed ?) Room for improvements next year so keep up the spinning everyone !